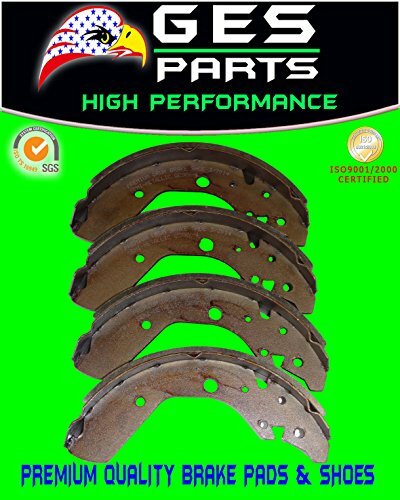 GES PARTS Brakes One Year Warranty1 x Rear Brake ShoeLEFT & RIGHTSET OF 4 PcsFitting and bedding un procedures for asbestos free brake Pads. The Product Function Matches The GB5763- 98, German TL- 110, PV- 3211 Etc. Standard Completely. The Friction Material That GES PARTS Produce, Have The System Move The Function Sta- Bility And Bear The Friction Good, And Have No Noise, And Free From Pollution Advantage Our Product Had Passes ISO9001: 2000. With The High Poit Of Departure, High Technique, High Quality, Solidify Of The Creative Develop Strategy For Struggling, Civilization TrustWorthiness Offer Creative Off Road, Development Strategy, GES PARTS Come Out To Technology Creative Off Road. 1- Do not clean brakes with compressed air, a stiff brush or something similar.2- Do not whirl up fine dust which, if inhaled, can be harmful to health. Wear a respirator, if working in a poorly ventilated area. 3- Do not degrease guiding bolts and caliper spring assemblies, as they require special grease.4- Do not use any sharp tools, as inappropriate use of these might cause damage. Use special tools only (torque spanner, expanding tool, pull-out hooks, etc. ).5- Flush system with fresh brake fluid. And check all hydraulic parts for excess wear and tear. 6- Check disc for scoring or grooves over 012" depth. If either applies, resurfacing is required. 7- Use soap and water to clean disc's surface after sanding and machining. Discs should be free and clear of oil, grease, and brake fluid. 8- Before you drive the car, start the engine and make sure that you pump the brake pedal a few times. Do this until the pedal travel is short and firm. If you have any questions about this product by GES PARTS, contact us by completing and submitting the form below. If you are looking for a specif part number, please include it with your message. By Kampi Components Co. Inc. Car Cell Phone Holder - Hands-free Cell Phone Holder for Car, Air Vent Car Phone Mount with Auto Lock and Auto Release for iPhone X/8/7/7Plus/6s/6Plus, Samsung Galaxy/S8/S7/S6/Note 5, Nexus 6, etc.